If anything proved to the citizens of Indianola that their seaport was making a name for itself in Washington D.C., it was not just the arrival of thirty-three camels on May 14, 1856, but a second shipment of forty-one camels the following February. The entire affair was an experiment initiated by the Secretary of War, Jefferson Davis, to test the viability of camels as beasts of burden in the Southwest. Davis believed, like so many others of that day, that the Southwest was mostly uninhabitable land. He wanted to see if camels—known for carrying tremendous weights, for traveling long distances without water, and for foraging off anything that grew in their path—might serve the military outposts spread across Indian country. USS Supply transported camels to the port at Indianola. tracked along the North African coast as Wayne purchased camels and hired three Arabs and two Turks to handle the beasts. When the camels arrived, Indianola—known for its serious business climate with ships clogging its docks and freight wagons and Mexican carts milling in endless throngs along its streets—came to a complete halt. Merchants and shippers, businessmen and crowds of children filled the streets and hung out of upstairs windows to watch and to laugh at the gangly camels. After three months at sea, the seven-foot tall beasts—both one- and two-hump varieties—stepped on solid ground and began rearing and kicking. They cried, and they broke their halters while frantic handlers fought to regain control. Some of the males even tried attacking each other before they were finally saddled. After hours of entertaining the townsfolk with their antics, the new arrivals, wearing colorful blankets adorned with tiny bells tingling in rhythm with every step, allowed the handlers to lead them along the coast road to old Indian Point where a corral had been built to house them until they became accustomed to their new surroundings. Like the throng following the Pied Piper, townspeople, still whooping and laughing at the sight, trailed the train of slowly plodding animals. The camels’ natural odor was so strong that freight drivers meeting the entourage were forced to turn their frightened mules away, even driving them into the edge of the bay to avoid runaway freight wagons. Some horses, seeing and smelling the approaching animals, reared and threw their riders over nearby fences. Some accounts claim that the builders constructing the corral for the camels had run out of lumber and resorted to piling the plentiful prickly pear cactus up to complete the fence. One of the qualities that made camels desirable for the arid West was that they would eat anything. They ate the prickly pear fence. 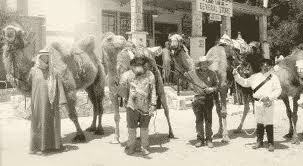 For three weeks, residents enjoyed following the camels as their handlers led them about town to prepare for the long trek to Camp Verde, south of present Kerrville. On one occasion a camel was led to the Quartermaster’s forage house to get four bales of hay, each weighing over 300 pounds. A skeptical crowd watched the animal kneel, and some people began having sympathy for the terrible weight being placed on its back. With the addition of each bale, onlookers became more confident of observing a failure. When the four bales were secured, the camel rose and walked away without noticing it carried over 1,200 pounds. When the camels finally plodded off toward the West, residents watched them go, assured that Washington, D.C. recognized Indianola as a fitting place to land its most extraordinary experiment. Camels at the Camp Verde Store. A second shipment of forty-one camels arrived in 1856, and the great, lumbering beasts made their way to Camp Verde. Twenty-five camels were used to survey a wagon road from Fort Defiance, New Mexico, to the Colorado River and on to California. The Camel Corps proved successful again in 1860 as it carried the equipment for a survey team mapping the Big Bend. The Rev. John Wesley Devilbiss, a Methodist circuit rider, wrote an account of a brush arbor meeting he was holding just south of Camp Verde. He said that just as the singing began, six camels appeared carrying wives and children of military officers from Camp Verde. After spending the day at the camp meeting, the families boarded the camels and rode back to Camp Verde. During the Civil War, the posts in the west fell under Confederate control, and the camels were scattered. Some were used to carry bales of cotton to Brownsville for transport to British ships anchored at the mouth of the Rio Grande. One infantry commander employed a camel to carry the baggage for his entire company. The end of the camel experiment came, not from the camels’ failure to fulfill their mission as beasts of burden. It ended because the camels smelled terrible, they frightened horses and mules, and their American handlers detested them because they were not as docile as mules. They were auctioned off to private owners and allowed to wander off on their own. Feral camels were still being sighted in the early 1900s in the Southwest. 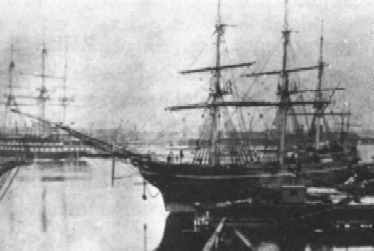 The next blog post opens with the gathering of war clouds over Indianola, the seaport accustomed to welcoming ships and travelers from all over the United States. Fascinating! I’ve heard that camels can be mean and that they spit at people. 🙂 Ornery! I love this Myra, cracks me up laughing 🙂 Big stinky beasties! Interesting that the camels had such a bad odor. We rode camels in the Australian outback on a day trip but I do not recall an unusual smell. Perhaps they were sanitized for the tourists. Looking forward to the next installment of Indianola’s history and the arrival of Stein House. We rode camels in the Outback. I think they had been sanitized for tourists!! Stein House is here. The last shipment arrived last night. I’ll have books for the Nov. 6 book signing at Book People. Hope to see you there. That was fun about the camels. They are not nice. I had some experience with them in East Africa. I loved your photo with the camel.